to vigorously represent a person’s best interests and to help them acquire necessary services and supports. to begin an ongoing, hopefully life long relationship that may develop into a true friendship over time. to stand with a person during good times and bad times. to evaluate and hold human service organizations accountable for their actions. to offer guidance, affirmation, and direction through your presence, personal example, and advice. to arrange for a person to take advantage of new or better opportunities in our community in work, education, civic involvement, neighborhood involvement, or leisure. to help cut through policies and procedures that can sometimes overwhelm. to assume responsibility of a person’s finances and to help the person with planning a monthly budget and saving for the future. to provide a forever family. to assume court-sanctioned responsibility for a person’s major personal or financial decisions. to respond and be present to a protégé immediately on a short term basis until a long term advocate can be recruited, oriented and matched. to offer your skills, talents, expertise, and influence to a citizen advocate who is advocating for his or her protégé. Advocate associates are needed in the areas of networking, political savvy, law, journalism, financial planning, housing, employment, medical, and education. A competent, independent citizen acting with the support and sanction of a Citizen Advocacy office that is free from conflict of interest, who freely and voluntarily represents as if they were his/her own the interests of one other person who has a disability.An individual who will assist the Citizen Advocacy Coordinator in finding a person who will become a citizen advocate for a particular individual, by talking with friends, neighbors, co-workers, and other people in one’s own community. A person who possesses skills and knowledge useful to advocates and protégés. An advocate associate can offer advice, support, and perspective on such matters as housing, legal advice, employment, health, strategic planning and various technical skills. 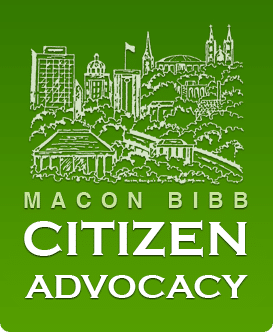 A director of the board of Citizen Advocacy who shares the responsibility with other board members of advancing the mission and sustaining the presence of Citizen Advocacy in the Bibb County area. The board is a governing, policymaking board which ultimately holds responsibility for the success of Citizen Advocacy in the community. Board members are expected to be active, participating, informed, working members. An individual who serves on a committee formed by the board, but is not a director of the board. A person may serve on one or more committees, including public relations, fundraising, Citizen Advocacy, or other ad hoc committees. A committee member may also focus on a specific sector of the community, such as business, labor, Churches, etc. A person who agrees to spread the word about Citizen Advocacy to friends, neighbors, and community associations. A person who gives financial support to sustain Citizen Advocacy in the Bibb County area, either personally or professionally. Such support is purely voluntary.